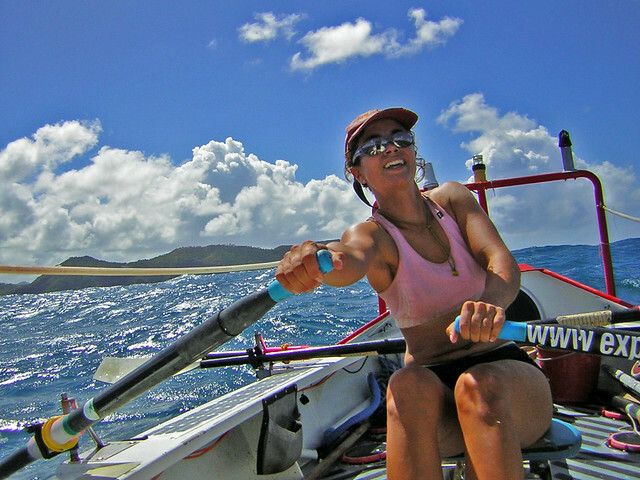 In 2005-06, Julie Angus rowed 10,000 kilometers across the Atlantic Ocean, becoming the first woman in the world to travel from mainland to mainland in a rowboat. She was accompanied by her fiancé at the time, Colin Angus, who was completing a round-the-world expedition using human power only. The 145 days they spent rowing across the Atlantic offered Julie Angus, a trained scientist, a rare perspective on the ocean. The slowmoving boat attracted barnacles, fish, turtles, sharks, whales, and birds, which Angus was able to document. Despite this abundance of life, she also saw signs of the devastation of the sea. The sharks that she should have seen most abundantly, oceanic whitetips, were not in evidence at all. During the journey, the couple was hit by four cyclones, including two hurricanes. The boat was hammered by ten-meter waves, and Angus likens the experience to riding a barrel down never-ending waterfalls for four days. Rowboat in a Hurricane is a gripping adventure story of a woman’s difficult and courageous journey with her partner in a cramped vessel. More important, it is a unique record of an amazing ecosystem, its fascinating inhabitants, and the many threats they face. While I’m on the subject of impressive women… Julie [Angus] became the first woman to row (with Colin) across the Atlantic Ocean from mainland to mainland… The Vancouver-Island resident has written about that trip in her new book, Rowboat in a Hurricane. It’s a fascinating read from a woman who didn’t discover the outdoors until she was 21, and who still claims that she’s ‘not an adventurer. Rowboat in a Hurricane… describes with dismay and alarm the amount of trash floating in the water, most of it plastic. …The voyage reinforced Angus’s sense of the interconnection of land and sea, of how the health of life on land depends on the vitality of the oceans. …This book is a testament both to human courage and to human destructiveness. Angus deftly weaves personal detail into the story, fleshing out her small cast of characters. [Rowboat in a Hurricane] is filled with engaging and insightful personal, historical and scientific anecdotes. …Like many other adventurers before her, Angus bravely sacrificed a host of human comforts to give us a glimpse into an experience most of us wouldn’t dare dream of. At the same time, she humbly inspires us to make a small effort to reverse the tide. Her book, Rowboat in a Hurricane… is an absorbing and inspirational read about their cramped and bone-wearying self-funded sojourn…Like many other adventurers before her, Angus bravely sacrificed a host of human comforts to give us a glimpse into an experience most of us wouldn’t dare dream of. At the same time, she humbly inspires us to make a small effort to reverse the tide. Telling a classic survival story from a feminine perspective, Angus’s narrative is a first-hand account of waters most people will never visit. In this riveting, true story, author Julie Angus, and her fiancée set out from Portugal in a 23-foot boat made from quarter inch plywood. Julie Angus offers the female perspective and draws on her background as a molecular biologist to infuse her tale with statistics about the changing ocean environment. …Angus writes with such good humour and honesty… that any overlap is soon forgotten. …and you can’t help but admire her candour. When Julie Angus… takes to the sea, she dives in deep, as evidenced by her 145-day journey by rowboat across the Atlantic Ocean. Angus’s slow-boat venture enabled her to explore the ocean ecosystem up close and chronicle the once-abundant species that are now faced with the threat of devastation.